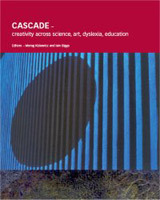 CASCADE is for dyslexic learning support practitioners, academics and artists interested in the relationship between dyslexia and creativity, for those involved in developing diversity in teaching and learning, those interested in creative process and practice in academia and those interested in hearing the voice of dyslexic people. This forum has developed from a three day conference combining research papers, project outcomes and creative work in Higher Education. A full list of contents is available by following the Table of Contents link to the left. The hard copy of the book is available for £20, cheques made payable to the University of Bath. As I am on long term sick leave, my colleague, Dr Jack Whitehead, in Education and co-author of Cascade, has agreed to take over management of this website. updated: 20 October, 2008 by the web team.